I'm going through photos from last year's trip to Appalachia, to supplement my writing up of the roadtrip tale on my blog. As you drive north from Shady Valley the forests close in, the valley narrows, and the road begins to wind, following Beaverdam Creek upstream. Holston Mountain, to the west, and Iron Mountain, to the east, come together at the head of the valley. And there you find Backbone Rock. According to this website, the tunnel was originally made for a lumber company railroad in 1901 -- a time when this part of the Appalachians was being rapidly penetrated by railroads and logged out. Beaverdam Creek flows around Backbone Rock but there was no room for a railroad bed, so they just blasted a tunnel through the rock. Afterwards, it was discovered that the locomotive's smoke stack was too tall to fit through the tunnel, so an extra bit of tunnel height was chiseled out by hand. The forests depleted, the logging companies soon left and much of the land ended up in the hands of the U.S. Forest Service. Today this area is part of Cherokee National Forest. There is a campground and recreation area at Backbone Rock, with trails leading off into the national forest. 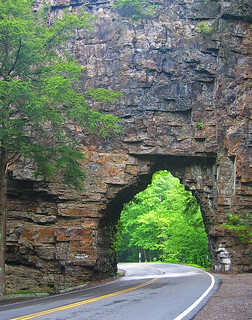 Highway 133 occupies the old rail tunnel. I'd have liked to have camped here, but it was far too early in the day for stopping. Instead, I went on to the Cumberland Gap and beyond.